Without further ado, here is my recipe for homemade iced tea. Turn off the heat and add all the tea bags to the water. Cover and let steep for 1 - 1 1/2 hours. Stir in honey until completely dissolved. Add 1/2 cup lemon juice. Pour into a heat-resistant pitcher. Add a mint sprig or a wedge of lemon as a garnish. 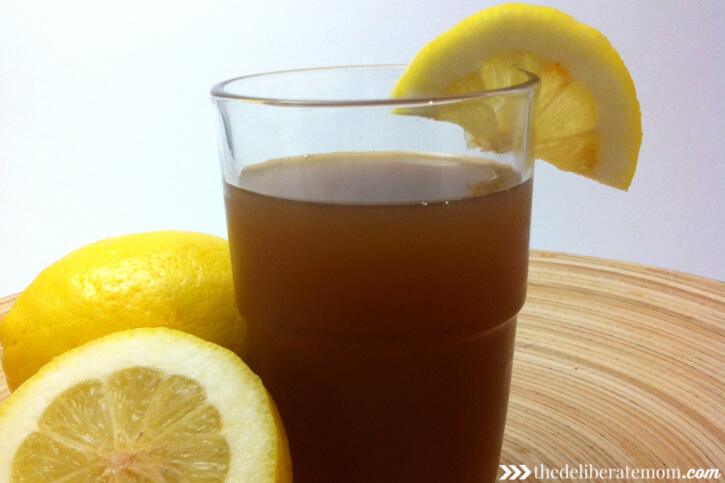 Do you have a favourite homemade iced tea recipe? Mmmm ice tea sounds delicious right about now! It is a perfect drink for those hot summer days! You’re right iced tea is THE drink for hot summer days! It is really yummy. I’ve tried the unsweetened tea but really didn’t like it (it’s too bitter for my taste buds). Thanks for pinning! I hope you love it! I haven’t drunk ice tea for YEARS!! …And this summer has been ice-coffee overdose :-) …I’ll need to test this one out! Thanks for the tried and tested recipe. Ooooh, I hope you like it as much as I do! I used to be a big iced tea drinker when I lived in Texas – there, it was called “sweet tea.” It took about as much sugar as tea to make it and was something of a diabetes-inducing drink. I’ll try making yours because I’m kind of nostalgic for it now. Honey. Who’d have thought? I know right?! Honey seems like such a practical substitute. I can’t really recall when I became an iced tea fanatic. Thanks for stopping by my friend! We add a pinch of baking soda in our tea down here. My parents always did it, and I think my mom said it helped make it not bitter or something like that. I’m guessing what it really helps with is the acidic nature of tea, making it more alkaline. Baking soda?! Do you add a pinch per cup or a pinch to the pitcher? I will have to give that a try. I actually use maple syrup for coffee! And that’s the one instance, in which honey really won’t do. Although my husband does it! I’ve never liked tea or iced tea, but I can feel it growing warmer over the years. I bet I haven’t had it just right quite yet. The maple syrup in the iced tea wasn’t horrid but it wasn’t that great either. It’s funny how after writing this post, I’ve discovered how many people don’t really care for iced tea. Very interesting. Now you’ve gone and made me want to make ice tea. I used to drink it unsweetened all the time, but this year, we’ve hardly made any! The power of suggestion. Go make the iced tea Brenda… you know you want it (insert maniacal laugh here). I would take iced tea by IV if I was allowed. I’ve been cutting back on sugar consumption just like you, though, so I’ve hardly had any all summer. I feel less “guilt” with the honey being in the iced tea. You might just have to make some! Yum, Jennifer! This iced tea sounds like it would hit the spot! My mom used to make a good iced tea too. We lived in a two story house and the roof on the living room part of the house was flat. You could open the window in the upstairs bathroom and step on to the roof. She would always brew her tea by leaving on the living room roof all day long. She called it sun tea. It’s a super yummy iced tea Susie! Thanks for sharing your memories of iced tea as well. Sun tea… I like that! Oh this sounds like it would be yummy! I am a sweet tea freak, and my mom finally kicked her sweet tea habit a few years ago and wishes I would stop putting so much sugar in mine. I’m gonna try this and share it with my mom too, it sounds way better than the tea she drinks! It is super yummy! I don’t feel as guilty drinking this one (since it has honey in it)! I hope you and your mom enjoy it. This tea sounds delicious! How do you come up with such great recipes, Jennifer?! Yum! How do I come up with great recipes?! Lots of mistakes Kelli… lots of mistakes. I am not a big fan of iced tea, but that’s probably because I haven’t found one I like and I’d rather dehydrate before drinking a shop bought one! I like the sound of this one though, especially if the orange pekoe tea tastes orangy – and why wouldn’t it? I have no idea what orange pekoe tea is though and would probably battle to get it here….They still still Liptons tea here! Which I am sure was made illegal under the Ban Desgusting Tea act. Well, I don’t think orange pekoe has an orange flavour. It’s just one of the simplest, plain teas. This iced tea is yummy though. The honey gives it a pleasant sweetness.